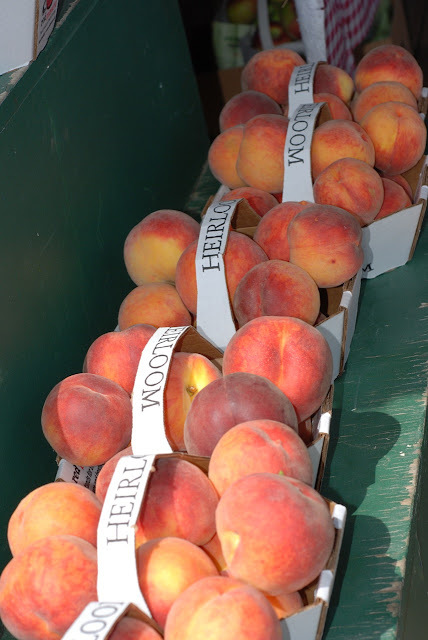 The peaches are ripe in Vermont! That means peach jam. So we made a trip with Heidi to the orchard to buy this year's supply. 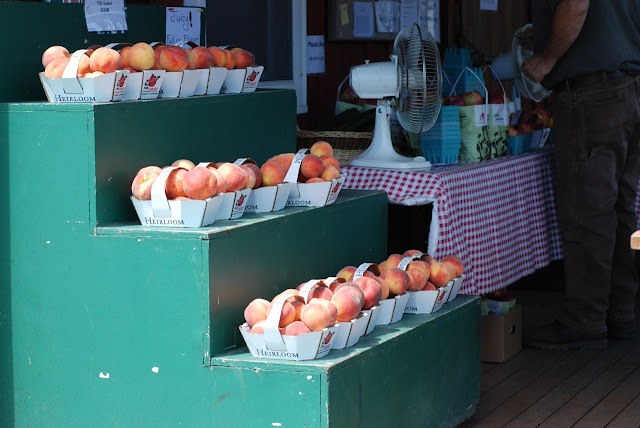 Peaches are improbable fruit for Vermont, but the local varieties have improved dramatically in the last few years. I think this year, the weather has been very favorable for them, because they were absolutely beautiful: tree-ripened, large, fragrant, and heavy with juice. These are the seconds! 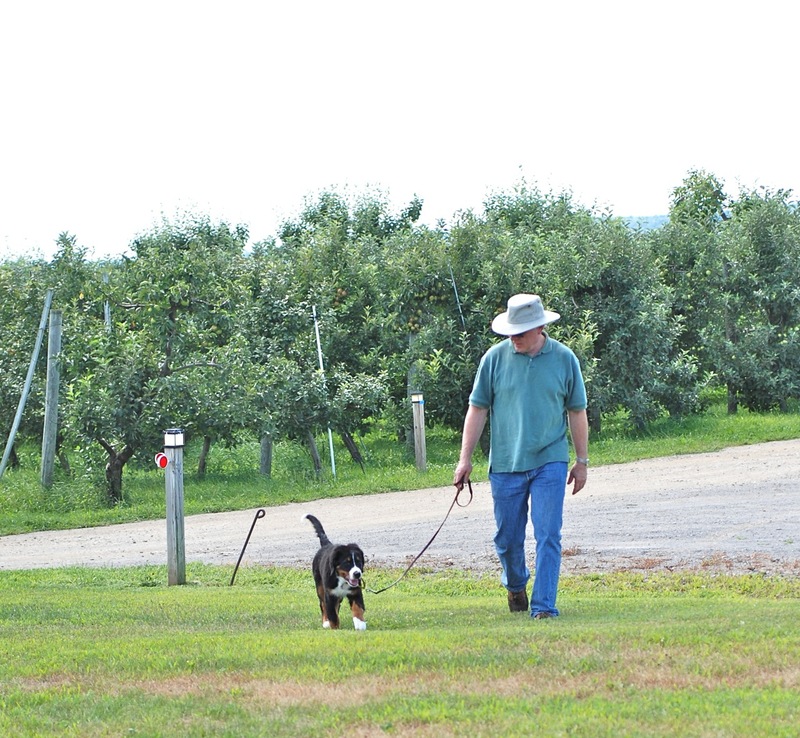 I bought two boxes while John walked Heidi around the beautiful hilltop orchard. 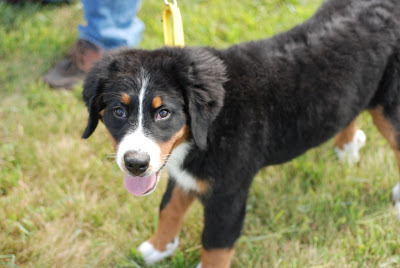 She found a shady spot under the apple trees. The peaches are in varying stages of ripeness, so I decided to make jam first. 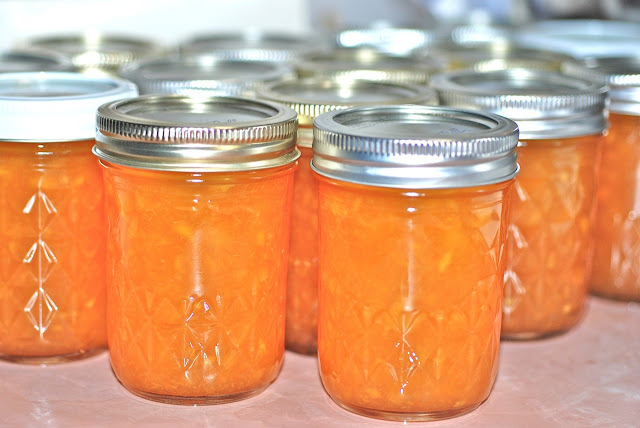 The jam yield this evening was 19 jars from 8 cups of chopped peaches, plus sugar. 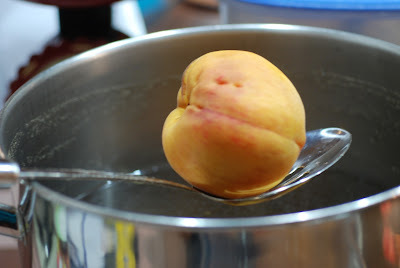 Making peach jam is very easy to do, since using pectin is recommended. That means you don't have to cook it to death in order to get it to set up. 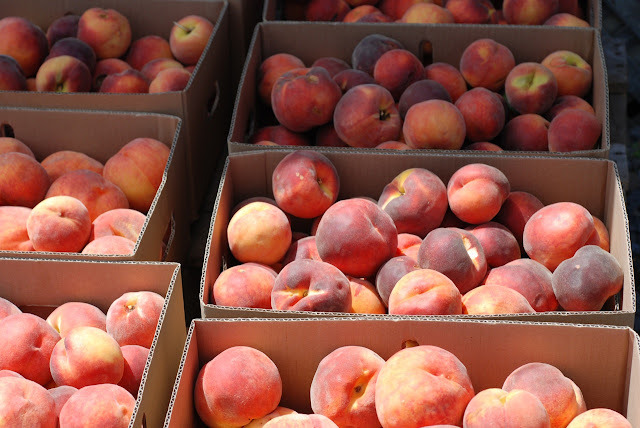 The resulting jam is fresh and bursting with peach flavor, and it will stay that way until your next visit to the orchard. 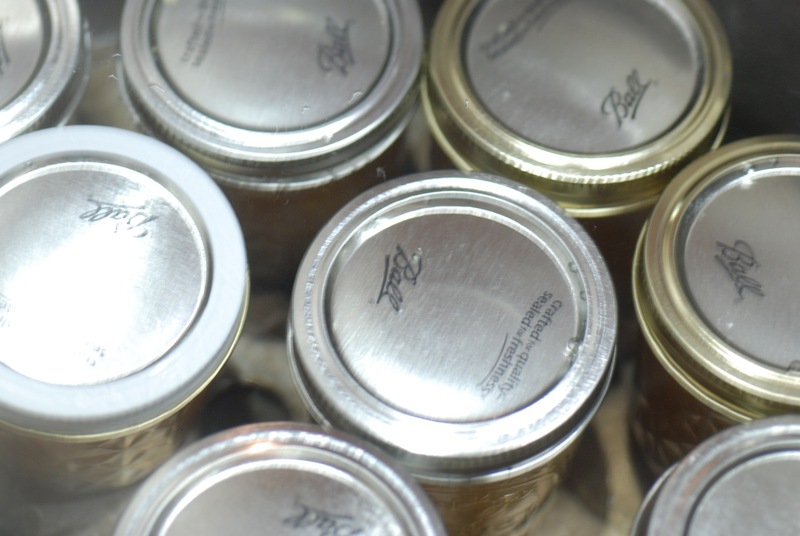 12- 8 oz canning jars, lids and rings. 1. 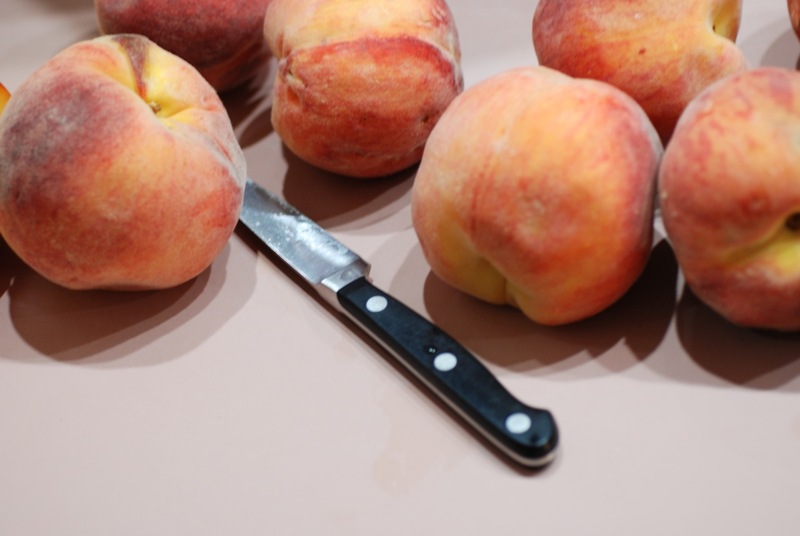 Wash, peel, slice, and chop the peaches, then measure four cups out. Note: I use the food processor to chop them. If the peaches are ripe, you can peel them by submerging them in boiling water for 30 seconds, then in cold water to stop the cooking. Peel with your fingers. Sprinkle Fruit Fresh or 1 T lemon juice on fruit, to prevent browning. 2. Sanitize the canning jars, either in boiling water or dishwasher. Set aside. 3. Heat fruit and lemon juice in stock pot until somewhat hot. Add the sugar. 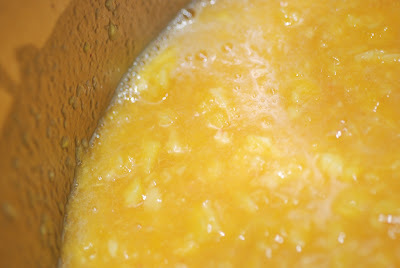 Bring to a rolling boil, then add the pectin, bring back to rolling boil, and continue boiling for another minute or two. 4. Remove from heat. Cover while getting jars ready. 5. Jars: Put hot jars on the counter, and put (brand new) lids in a measuring cup full of boiling water. You cannot re-use old lids. 6. Fill the jars: Insert a canning funnel in the first jar. Using a large ladle, fill the jar to within 1/2" of the top. Continue around, filling all the jars. 7. Using the canning magnet, lift a lid out of the hot water; holding it by the edges, shake off excess water. Drop the lid on the hot filled jar, and continue for all the jars. 8. 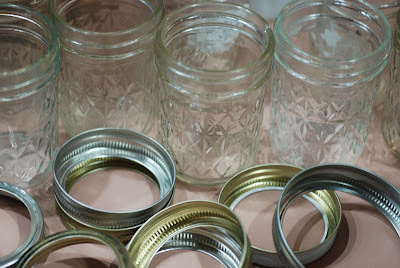 Put a ring on each jar, spin it to get it started, then tighten down until it's tight, but not as tight as you could make it. It's tight enough to seal, but still able to let air escape when heated in the water bath. 9. Water bath: fill a large stock pot or canning pot with hot water, half full. Heat to boiling, then using the canning tongs, lift each jar and lower into the bath. Working quickly, add more jars until the bath is full. 10. Keep heat turned up to high, and process for 10 minutes. If the water has cooled down, allow it to re-simmer first, and add that to the time. 11. Remove from the bath with tongs, tighten down any loose lids. Whew! you're done! The jam will set up over the next couple of days. Put it down in the cellar. Next up: a nice dessert, then can some sliced peaches. I have plenty left. However, Heidi wouldn't mind going back for more. Can't wait to see more peach desserts. I love this time of year for baking, I just wish it wasn't so darn hot!